Battle Weary is an experiment to see if the roguelike genre could be made enjoyable with a screen reader. It was made for the 2019 Seven-Day Roguelike (7DRL) game jam. Most of the gameplay uses the arrow keys and space bar to select actions or move around the map. You can press "H" at any time for help and "C" for an overview of your card decks. If you are using a screen reader, you can also press "S" to speak the current status of the game. 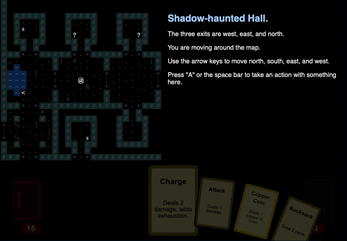 In order to make playing the game less tedious for screen reader users, this roguelike moves by "room" instead of by "tile" and doesn't bother with relative position of your enemies. Your character is represented by a deck of cards. At any time, you have a hand of cards, and when you fight a creature, you can play any cards you want out of your hand. When you run out of cards to play, your opponent gets to play a card, and then you draw four more cards into your hand. You die if you draw four "deadly" cards as your four cards - "Wound" cards, "Exhausted" cards, and "Curse" cards. There are ways to get rid of these cards from your deck and buying new cards – explore the town and other areas to find them! But now I changed it to English and it perfectly works. I find it exemplary that you enable people with visual disabilities to enjoy your game. Well done! For people interested I can recommend Roguelike Radio episode 48 about "Designing for the Visually Impaired". The game mechanics are also quite well-considered. 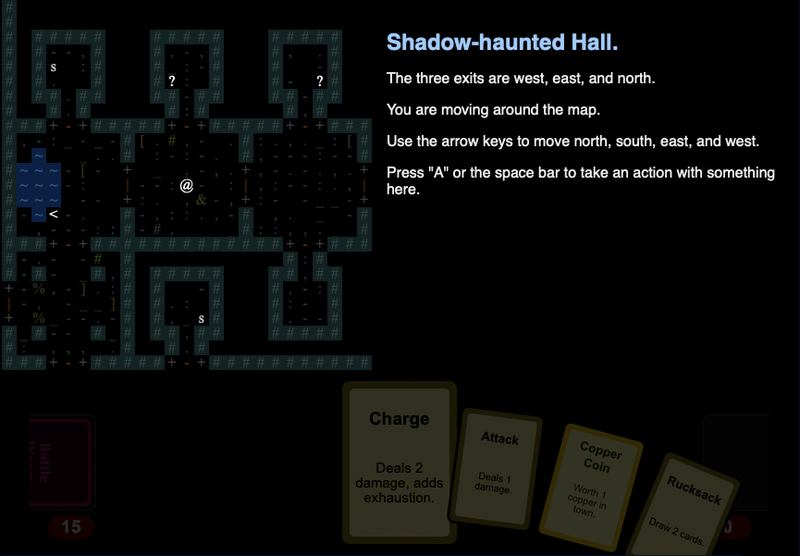 I like how you combine a roguelike with a deck-building game. Great game. Want to play the next version for sure. I really like the game so far. I play using NVDA screen reader on Windows, and it work very well. Thanks for creating this cool game. By the way, is there a key to quit a game once started? Pressing arrow keys move the character, while pressing keys like tab, q, or keys not used by the game will say "bad key". In the end, I close the browser tab in order to quit. There is no explicit, built-in key to quit the game. I assumed that users would either reload the page or simply navigate away or close the browser window when they were done playing, but if there's a convention for quitting browser games from a screen reader context, let me know and I'll see if I can implement it. Nice! Thanks for letting me know how it works. I haven't been able to test it with NVDA - only VoiceOver - so it's good to hear it's working on other screen readers. Well done, and the mechanics are really interesting. Thanks for making it and I hope you can get feedback from some differently abled folks to see if you did well on the accessibility front! Glad you liked the game! I still haven't heard from anyone who primarily uses a screen reader. I really hope it works and I'm not overlooking some glaring, obvious problem with the way I approached it!